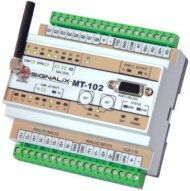 Description: The MT102 is is a wireless telemetry module with built-in GSM/GPRS modem and PLC function working with ModBus RTU protocol etc. over GSM/GPRS network. The modules can act as ModBus Master or ModBus Slave. Alarms and control can also be done by SMS messages. An OPC Server specially designed to communicate over GPRS networks is delivered together with the module. The OPC server updates on scheduled queries and programmed events to reduce traffic costs. The OPC Server also has a built-in ODBC interface for writing and reading to/from databases. As a Master, the MT-101 reads a Slave devise and buffers the data in is own memory to enable alarm sending based on registers from a Slave. Features: Module with GSM/GPRS communication; 8 Optosiolated binary outputs/inputs/counters; 6 Optoisolated analogue inputs 4-20 mA; 1 Serial port RS232/485/422; Installation on DIN-rail; Firmware, program and configuration can be updated remotely over GPRS; Network possibility; worldwide networking with GPRS roaming; OPC Server with ODBC function included. Specifications: See attached spec. sheet.